Synopsis, taken from the book's dust jacket: Seventeen-year-old actress Kelley Winslow thinks that playing the role of the fairy queen Titania in a production of Shakespeare's Midsummer Night's Dream could be her lucky break - if she can pull it off. But when she meets the handsome Sonny Flannery, Kelley has to face the shocking truth that the world of Faeries is all too real and that she is an unwitting part of it. Sonny is a guard of the Samhain Gate, the doorway between the mortal sphere and the Faerie's enchanted, dangerous Otherworld. Usually kept shut, the Gate stands open only once a year, exposing the unsuspecting human world to an onslaught of malevolent Faerie creatures intent on destruction. Sonny warns Kelley that she is no mere mortal, and that she is being hunted by powerful forces from the Faerie realm. Now, Kelley must come to terms with her heritage - and her growing feelings for Sonny - if she wants to save not only herself, but also the human world she holds dear. I've mentioned several times before that after I'm done with my current novel, I plan on writing a novel about faeries. It's an idea I've had kicking around in my mind for years, and not a day has gone by in the last couple of months that I haven't thought about it - even though I'm knee-deep in the rewrite/revision stage of my current WIP. I decided that I would read as many books about faeries as I could to see what's out there to make sure my idea is original. 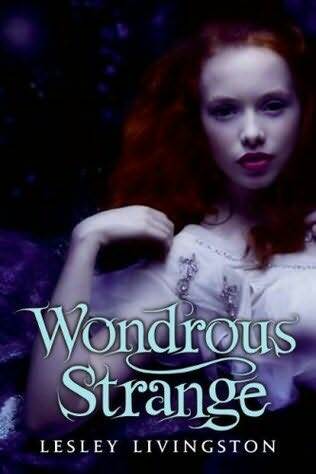 I was surprised to discover there really aren't that many faerie books (although they seem to be gaining popularity), but that's how I came across Wondrous Strange, and let me tell you, I am so glad I did. 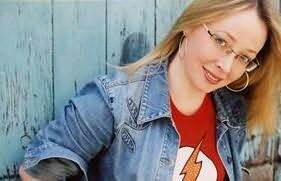 I just want to talk about Lesley Livingston first for a second. When I chose this book, I had no idea that she was a Canadian author. Not only is she Canadian, she apparently lives about 2 hours from me. When I found this out, I was so excited that I tweeted: Started reading Wondrous Strange by @LesLivingston last night and just realized she's Canadian - I love her already! ;-) A few days later, she tweeted me back saying: @SweetMarie83 I ♥ u right back fellow Canuck! How cool is that? I was ridiculously excited. Also, she has a masters degree in English, with a specialization in Arthurian literature and Shakespeare - if I'd known I could have gone to university and studied Arthurian literature, I would have! I think that's so cool, and I love how she worked her knowledge/love of Shakespeare into Wondrous Strange. THIS is what a faerie story is supposed to be. I've read quite a few over the last few weeks, and some have been good, some not so much, but this one was what I've been looking for and waiting for. Finally! Kelley and Sonny are great characters. Kelley is independent and willfull, trying to make a life for herself doing what she loves, and on her own terms. Sonny is loyal and strong, sweet and protective. As a guard of the Samhain Gate, he's between the worlds, not really belonging in either, but like Kelley, trying to do his best and make it work. Both are believable and relateable characters, as are all the other characters. I won't go into detail, but I loved Maddox and Bob, too - you'll have to read the book to find out what I'm talking about! I like how the story is shown from both Kelley's and Sonny's perspectives. Most YA books I've read are told from the perspective of just the main character, and there's absolutely nothing wrong with that, but I do enjoy getting a deeper insight into a character by seeing things from their perspective. It just gives more depth to the story I think, and it worked perfectly in this book. The plot is well-thought-out and original. It's like a blending of old and new - legend/myth and pure imagination. I love that it's set in New York City, a place that feels familiar to most us of, even if we've never been there. There are some great twists, turns and surprises, action, and just enough romance in the storyline for a romance junkie like me to appreciate and be left with hope. I love that Kelley and Sonny don't fall in love right away, and that Kelley doesn't fall all over herself to be with him. The fact that they have to work for it and they have a lot of obstacles along the way makes it that much more interesting and believable. One final thing I loved about this book: the cover. I'm a total cover-whore - if you've been reading my blog, you'll know that I often choose books completely at random based on titles or covers, and this would be one of those books. It's simple but so beautiful and ethereal. I can't wait to see what happens next in Darklight, the second book in the series!